DUMBARTON climbed to seventh place in the Irn-Bru Scottish League first division with a 3-2 victory over Hamilton Accies at New Douglas Park. DUMBARTON climbed to seventh place in the Irn-Bru Scottish League first division with a 3-2 victory over Hamilton Accies in front of a 974-strong crowd at chilly New Douglas Park. Ian Murray's men, buoyed by victories over Dunfermline Athletic away and Raith Rovers at home in the past week, began as much the stronger side, taking command from the start. Jim Lister and Bryan Prunty both had chances before Steve McDougall netted the opener with a thunderbolt from a narrow angle. 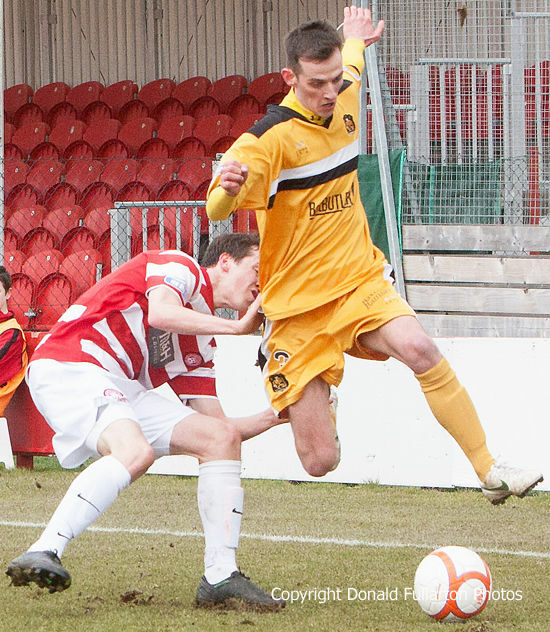 After 30 minutes Accies were down to ten men when Fisher was given a straight red card for a tackle on Paul McGinn. Sons stayed in charge, but the second goal did not come until shortly after half-time . . . and it was worth the wait. McDougall sprinted half the length of the pitch, beat the keeper, then passed to Scott Agnew to roll the ball into the empty net. However the home side fought back bravely, with Ryan netting a shot in 63 minutes. Twenty minutes later full back Paul McGinn broke forward, cut inside, and shot home for the third goal. Still Billy Reid's ten men did not give up, and Stevie May scored with three minutes to go, giving the visitors a nervy finish before they left with the three points. The picture shows James Creaney hurdling a tackle.